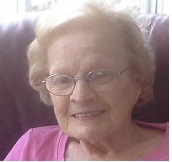 Lucille M. Isom, nee Hill, 101, of Lake Worth FL, formerly of New Athens, IL, born April 9, 1917 in New Athens, IL, passed away at her home on Saturday, March 23, 2019. Mrs. Isom was a homemaker. She was an avid bingo player who loved playing with her sisters and friends. She was preceded in death by her parents; John and Ida (Schrag) Hill, her husband, Wilbert Joseph Isom, whom she married on September 23, 1934 in Nashville, IL and who preceded her in death on April 1, 1981, 2 sons; D.V.M. James Isom and D.D.S. Jared “Jerry” Isom, 2 brothers; Ramon “Raymond” and Wilbert “Buddy” Hill, 4 sisters; Dorothy Jetton, Delores Bardos, Sylvia Hill and Fern Hagan, 3 brothers-in-law, Wayne Hagan, Frank Bardos and Everett Jetton and sister-in-law; Audrey Hill. Lucille is survived by her daughter, R.N. Judith (Dan) Nelson of Lake Worth, FL, who lovingly took her into their home and took great care for her for 10 years, 2 daughters-in-law; Mary Isom of Belleville, IL and Holly Isom of Jupiter, FL, 9 grandchildren; Robin (Mike) Nowlan, Steven (Kelly) Isom, Keith (Shirley) Isom, Burke Fietsam, Wendy Fietsam, Kelly (Mark) Sonnentag, Marnie (Dale) Thrush, Elizabeth (Tom) Johnson and Laura Isom, 11 great grandchildren and many nieces and nephews. Memorials may be made to St. John United Church of Christ in New Athens, IL. Visitation: Friends may call from 2 to 3 p.m. on Saturday, March 30, 2019 at Heil-Schuessler Funeral Home in New Athens, IL. Funeral: Services will be held at 3 p.m. on Saturday, March 30, 2019 at Heil-Schuessler Funeral Home in New Athens, IL with Rev. Don Wagner officiating. Burial will follow at Oakridge Cemetery in New Athens, IL. Sympathy to the family. I still remember her and her sisters at KC Tuesday night bingos many, many years ago. Hello Judy , I wish to express my sympathy to you and your family on the death of your mother, I remember her well, her age was amazing, so many memories you have to cherish .